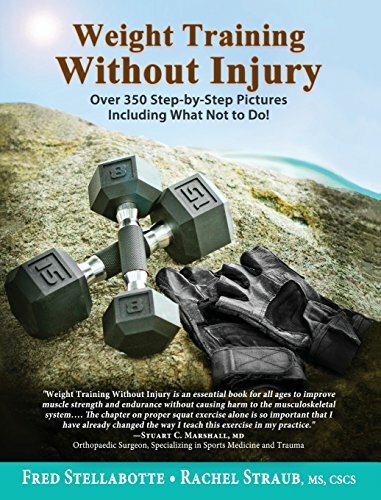 “Weight Training Without Injury” by Fred Stellabotte and Rachel Straub is an invaluable resource for all men and women interested in physical fitness. Whether you are a newcomer to exercise, a seasoned pro seeking to refine your practice, or a personal trainer, there is something in this book for everyone. The focus of the book is to learn how to exercise using proper form in order to prevent injury, specifically as it relates to weight training, using either free weights, machines, or your own bodyweight. The book is divided into seven sections. The first section consists of two chapters. Chapter 1 discusses how to make your workout more efficient. It answers some basic questions such as how many times a week to work out and for how long, how much weight to use, how many repetitions are most beneficial, alternating workouts between different body parts, etc. Chapter 2 helps you individualize your specific weight-training program, outlining a multitude of options to make your program successful. The remaining sections each focus on a certain body part, i.e., legs, chest, core, back, arms, shoulders, etc. Within each of those sections are a number of exercises, each one precisely defined and with pictures for every step. Key points are also outlined for each exercise to learn how to safely and effectively execute the exercise, and how to master your technique. It’s obvious that a significant amount of time and effort that went into writing this book. Clearly, the importance of health and exercise is a topic very near and dear to the authors, and it is apparent throughout the book that the main goal is to educate people on how to exercise safely and effectively. I loved everything about this book. My favorite part is the pictures. There are several pictures for each step of every exercise, including the wrong way to do the exercise. There have been so many times at the gym where I’ve wondered whether I was doing an exercise properly that I found I spent more time watching other people than actually working out! Also important is that the book is written using clear and concise language that the average person can understand. I am that average person – I don’t understand the lingo of most personal trainers and I certainly don’t want to be intimidated when using equipment with which I could hurt myself! Overall, I found “Weight Training Without Injury” by Fred Stellabotte and Rachel Straub to be a priceless resource and highly recommend it to anyone wanting a clear-cut design for integrating a healthy exercise program into his or her lives.